Ear Cleaning Tips for Dogs and Cats | This blog is affiliated with the Cedar Bend Humane Society in Waterloo, Iowa to share pet-friendly resources, adoption stories, and CBHS events. According to Animal Humane Society, keeping the inside surfaces of your dog’s ears clean will not only feel good to your dog, but is good way to help prevent ear infections. Examining the outside surface will also alert you to the presence of wood ticks, fleas, or anything else unusual. Clean your dog’s ears about once a week. You can use either a cotton ball or a piece of gauze with ear cleaning solution, or you can use a baby wipe wrapped around your finger. Don’t use water because it doesn’t evaporate very easily. Wipe the inside surface of your dog’s ear, going down only as far as your finger easily fits. Don’t use Q-tips or try to put anything further down the ear canal or you will risk causing a painful ear injury. Please also be aware that brown or black ear wax—and dry, dark wax resembling coffee grounds—are classic indicators of microscopic ear mites. Only your vet can tell for sure, so please don’t delay bringing a gooey-eared pooch in for a checkup. 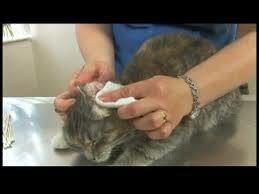 Place a little bit of liquid ear cleaner (ask your vet for a recommendation) onto a clean cotton ball or piece of gauze. Fold kitty’s ear back gently and wipe away any debris or earwax that you can see on the underside of her ear. Lift away the dirt and wax rather than rubbing it into the ear. And do not attempt to clean the canal—probing inside of your cat’s ear can cause trauma or infection. This entry was posted in Pet Information by cedarbendhumanesociety. Bookmark the permalink.